New York: 1870's: Pacific Mail Steamship Company 5 Inch By 8 Inch. 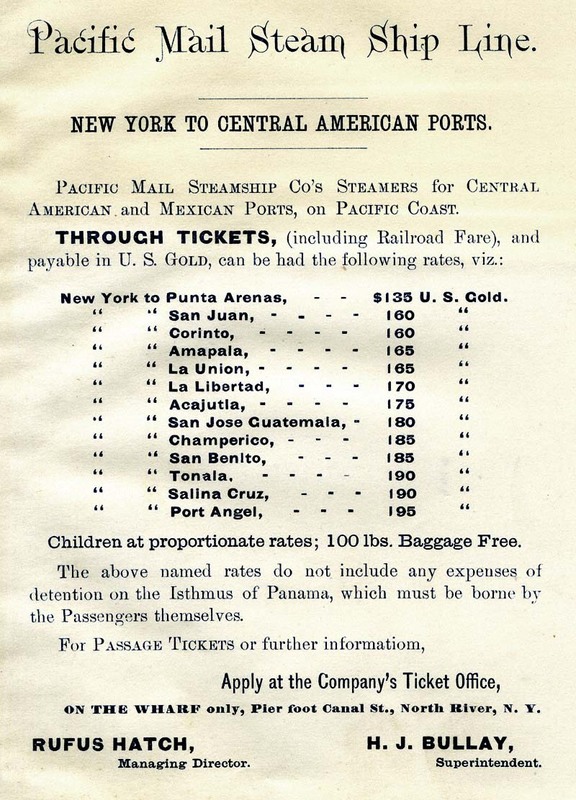 One page circular, showing rates of passage for tickets from New York to California via the Isthmus of Panama (crossing Panama by train) and stops at ports in Mexico on the Pacific Coast. Display Advertising for Pacific Steamer Services. "In the years before steamships, clipper ships provided passage from the East Coast to the West Coast by way of Cape Horn. In 1854 the Flying Cloud, true to its name, carried letters and passengers from New York around Cape Horn to San Francisco in a record-breaking 89 days. However, a three-month journey was not fast enough for those eager to make their way to California following the discovery of gold there in 1848. Nor was it fast enough for those already in California anxiously awaiting news from home. Responding to the jump in demand, coastal steamers quickly became the central communication link between the East and West Coasts. 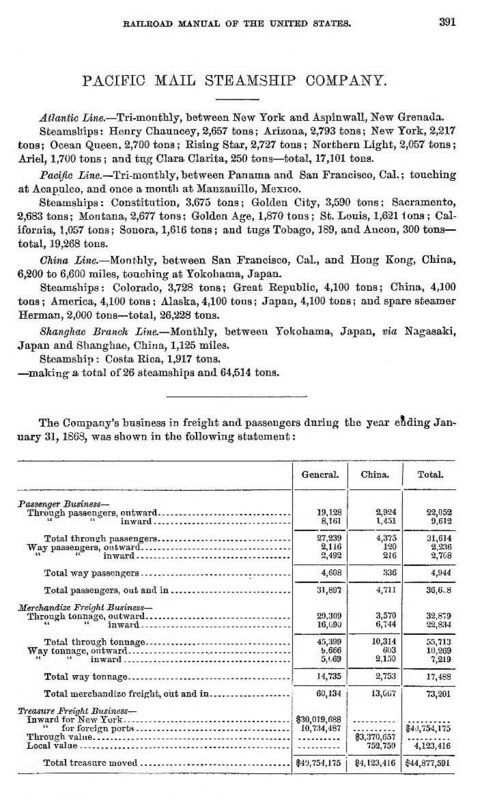 The Pacific Mail Steamship Company contracted with the U.S. government to carry the mail from Panama north to San Francisco by ship. By mid-century two companies monopolized the Panamanian Isthmus route, linking East and West Coast communications. George Law's U.S. Mail Steamship Company operated on the Atlantic coast, and William H. Aspinwall's Pacific Mail Steamship Company, on the Pacific. 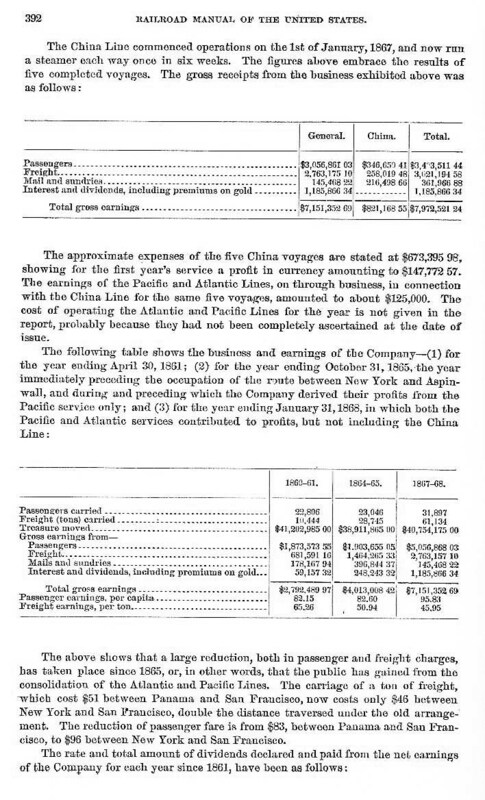 Tickets from New York to California ranged from $400 in first class to $125 in steerage, and passengers paid their own way across the Panamanian Isthmus. The 50-mile journey by mule, wagon, or on foot along jungle trails was difficult, and many fell ill. In 1851 the Vanderbilt Line opened a route through Nicaragua, all but 12 miles of it by water, giving California-bound travelers a more comfortable alternative to Panama. The exhausting overland trip across Panama became faster and easier in 1855 when the Panamanian Railroad began operations. 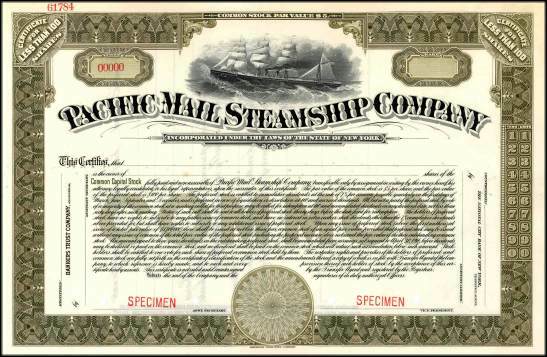 The Pacific Mail Steamship Company was ideally positioned to cash in on the Gold Rush of 1849. 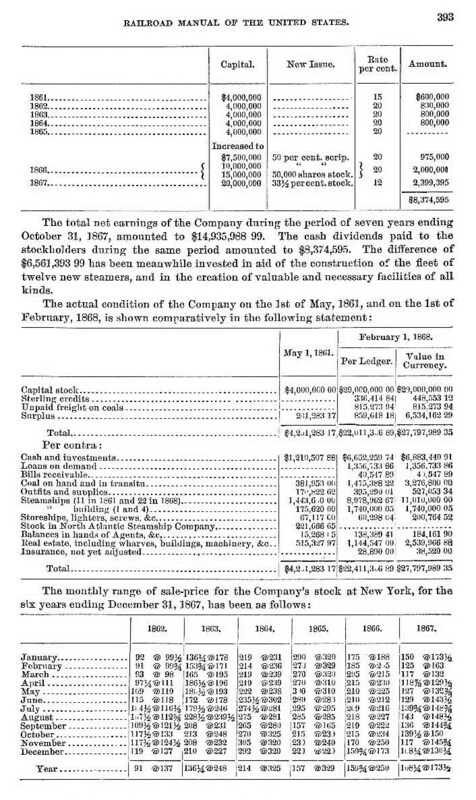 As a result of this and the high quality of its service, the company became both an important part of the history of the American West as well as one of the most profitable enterprises of its era, with an annual return on investment that ran as high as 30%. Within five years of its inception, the company was running 18 steamers and it peaked at 23 in 1869. In that year, however, the completion of the transcontinental railroad foretold the end of the high profits of the Panama-California route." Specimen Stock Certificate Image and Description Courtesy Scripophily.com. 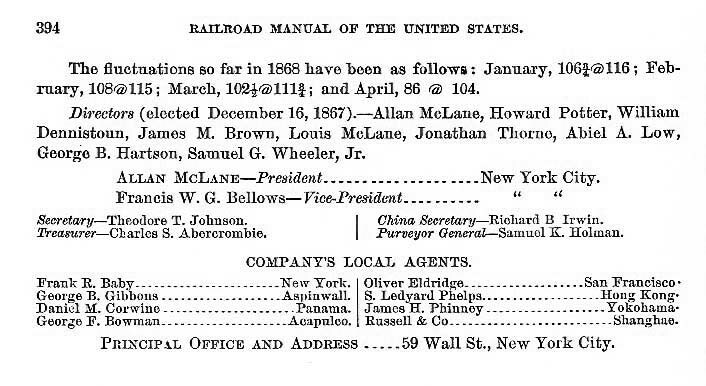 From "Manual of the Railroad of the United States, for 1868-69 ... "
by Henry V. Poor, New York, H.V. & H.W. Poor, 1868. Courtesy Douglas van Veelen.